One of the many reasons why the hospitality industry is booming is because of how establishments are able to incorporate the latest technology to improve the quality of their guest’s stays. Now, simply turning up to a hotel, checking in, sleeping, and then leaving in the morning is almost non-existent. The inclusion of technology is what improves the overall experience, so here are 5 of the latest hotel technology trends. Hotels all over the world might have already implemented these ideas fully, while others might be further ahead and could be testing out even more futuristic ideas in beta programmes to satisfy the customer’s further. Let’s take a look at each of these hotel technology trends in a little more detail. Gone are the days of losing a keycard, getting locked out of your room and being forced to charge to the front desk and explain your situation. In modern hotels, especially in 2017 and beyond, a guest’s smartphone will soon replace the cards that we currently use to unlock hotel doors for the ultimate security and convenience. This feature is just the latest mobile accessibility advancement since being able to check in and book with your smartphones, or even engaging with the hotel on social media. Although, don’t be surprised if in a few years’ time we’re moving towards facial recognition. There are already major hotels worldwide that have started to utilise this system, as they work with applications that allow guests to scan their phone to the sensor to get into their rooms, and it’s expected that more and more hotels will soon switch to app-based entry systems. With this hassle-free system, it can lighten the workload on those working in a hotel who might be delegated the task to head to rooms and sort the keycard issues out, especially if they have uncomfortable footwear. There’s nothing worse than walking into your hotel room and seeing a boring, old-fashioned TV and realising there are only a handful of Freeview channels working. In fact, hotels have now moved beyond that, and even your basic flat screen TV’s. Instead, you might walk in and find SMART TV’s awaiting you for an over-the-top entertainment experience. This piece of technology tailors viewing pleasure to your needs, as guests are able to utilise their mobile phones to stream whatever they want to watch. It doesn’t end there either, HD content is becoming a common trend and, if you’re lucky, services such as Netflix might also be available for you to log-in and binge watch your favourite TV shows during your stay. 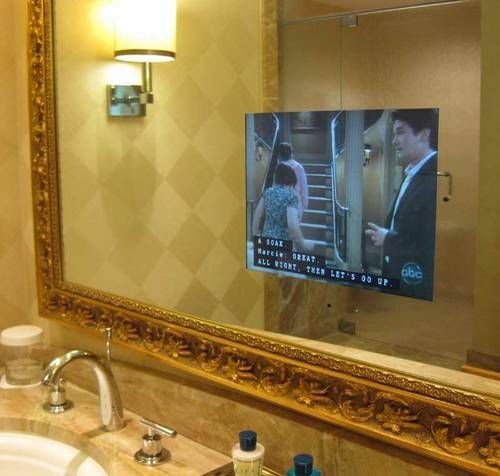 For your more luxurious stays, some of the high-end hotels have made mirror TV’s a reality. Just imagine watching HD TV in the bathroom mirror, whether you’re in your bed, in the bath or even hitting the sauna or swimming pool to relax and unwind. Then there’s wireless charging if your phone is compatible. People forget things at home all the time, such as mobile phone chargers and with this handy piece of technology, guests can simply place their phones on the charing dock or plate and not have to worry about losing or forgetting wires. Although there are hotels that allow you to ring the front desk, more often than not, you’ll need to head downstairs yourself to make requests or communicate with them. However, another advancement has seen many hotels make their guests stay even more relaxed by allowing them to remain in bed while they send a text message to the front desk through their smartphone. This communication can range from asking for more towels, or requesting a late checkout, while some might not be comfortable talking to staff on the phone. This service also makes life easier for those at the front desk, as they won’t have to chase guests around for something, as they could simply drop them a message or take special requests which is an addition they will welcome, especially since they’re on their feet all day. There are companies out there that can install smart lighting and thermostats in your own home, and hotels are now implementing this technology that will allow guests to adjust the temperature in their rooms with a smartphone, even when they aren’t in the building. This technology also allows guests to dim the lights in their room remotely, which is perfect for those planning a romantic getaway. Another simple and effective hotel technology trend is light sensors, where the sensors turn on when a guest enters their room and they turn off when the guest leaves the room and senses that there hasn’t been any motion for a while. So, you won’t be needing to call maintenance to your room over and over again to set the temperature just right. 3D image exploration is a piece of technology hotels use online before their guests have even arrived. One of the biggest worries when booking a room is wondering what the rooms will look like. We see general examples of rooms online when booking, but that doesn’t mean the room we get is identical to the one we saw and liked online. Now, there are hotels that have implemented 3D image exploration, and this allows potential guests to go on virtual tours of their room so they know exactly where they’ll be staying if they purchase a booking - so hotel staff members won’t be greeted by angry or confrontational guests if the room is not what they were expecting. While your hotel might be the most tech-savvy establishment your guests have seen, it’s important that you focus on technology that will keep your staff safe when working too. With slips and trips being the most common workplace accidents, it’s vital your staff have the safest shoes on the market with our new technology making sure you get home safe.